A guy who says his job is to “teach teachers how to teach” went to Colombia to get an education. That’s Colombia, the country, not Columbia University in New York City. Jim Mostofo, an assistant professor in the College of Education at Grand Canyon University and also a GCU graduate, left in late April for a one-month volunteer assignment helping teach English at two universities in Medellin, Colombia. He loved it so much – and was learning so much – that one month became two even though it cost him $370 to change his plane ticket. Now, he’s applying for a Fulbright Scholarship, which would mean teaching there for an entire semester. After Escobar was killed in a shootout with Colombian security forces on Dec. 2, 1993, authorities eventually were able to set Medellin on a new course. As a sign of that turnaround, the city was host this year to the World Urban Forum. Tourism, including visitors from the United States, is up. Colombia has become a destination. Mostofo worked at two universities shadowing Juan Gomez, a professor from New York who has been in Colombia for two decades. And while Mostofo didn’t stand out when he walked down the streets of the city of 2.1 million, his accent certainly fascinated his students. Mostofo also found, much to his surprise, that teaching English can be a challenge. It’s one thing to know grammar, but it’s quite another to be able to explain grammatical terms you haven’t studied religiously since you were in school. Most of the students were about halfway to what is considered the top level of spoken English, and Mostofo found they were much more comfortable writing English than speaking it. But that didn’t prevent him from having conversations with the students, and what he learned from them is intriguing. As a fitness enthusiast, Mostofo is anything but fat, but he explained to them that many restaurants offer free soda refills and large food portions, and that many Americans avoid exercise. In Medellin, he said, drinks are served in small glasses and most families have only one car, if that. When Colombians need to travel, they walk long distances, take public transportation or both. 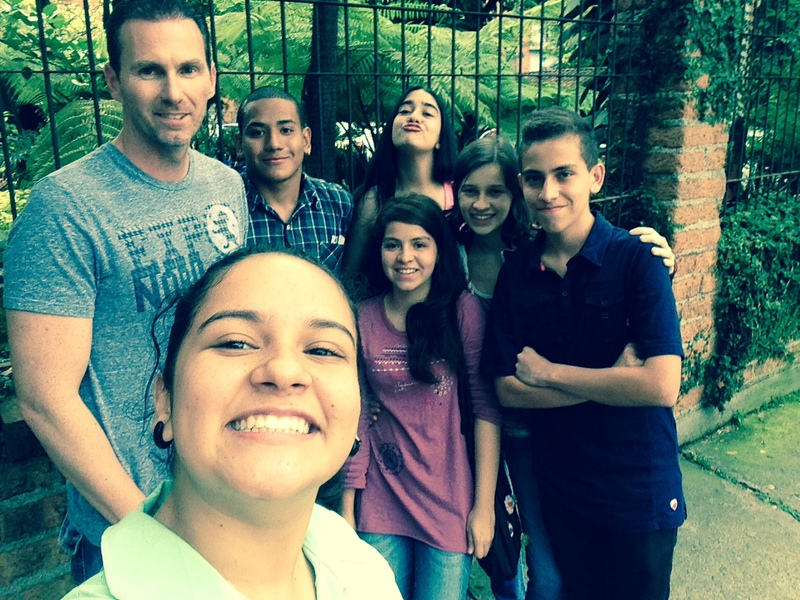 Members of a youth group at Jim Mostofo’s church showed him around Medellin. 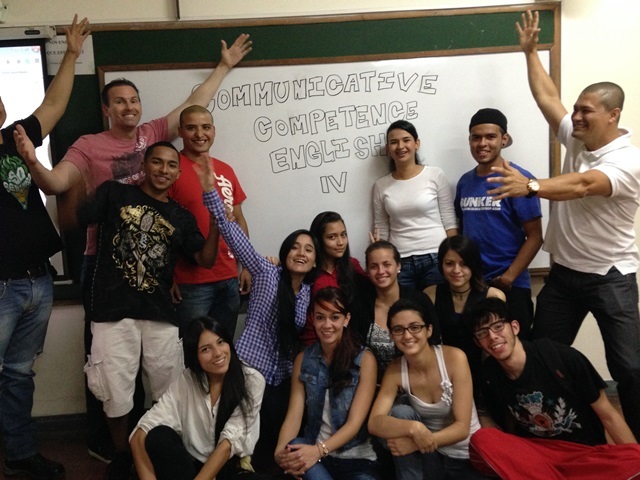 The students also wanted to know what Americans think of Colombia. When Mostofo told them the perception of danger still lives on in the minds of many people, the students were incensed. They are proud of their country’s progress and want the world to know about it. Mostofo said Medellin’s neighborhoods are divided into six categories, with 6 being the richest and 1 being the poorest. As long as the area in which he was walking was at least a 3, he felt safe. The Colombians he encountered thought nothing of going out of their way to help visitors who were lost. Once, he exited the wrong door of a theatre in a “2” neighborhood, was unable to hail a taxi and was not sure where he was going. Seemingly out of nowhere, a woman appeared and shepherded him to safety. There were days when Mostofo felt lonely, being in a foreign country where he barely knew the language. One of his greatest victories was connecting with the local cable-television provider and figuring out how to watch programs in English. His fitness regimen, which included daily workouts at a third university, put him in touch with people who expressed interest in having him come back to teach. It’s all part of the educational process. And here’s the funny part: Mostofo’s never been to New York. The students in Medellin, fascinated by American culture and figuring that it all starts with the Big Apple, found that unconscionable. So he intends to get there someday, too. To see a GCU video about Mostofo’s passion for teaching, click here.